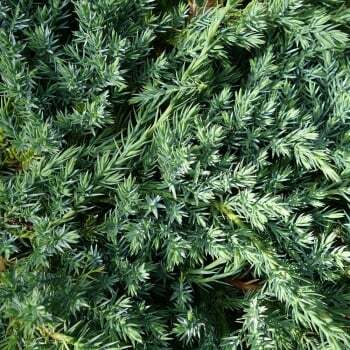 A wonderful evergreen conifer for ground cover with blue-green foliage. This spreading conifer will grow to just 0.25 x 2.5 metres in 20 years so is ideal for small spaces. Foliage is spiky, making this conifer a great choice to use as a deterrent. A medium sized shrub, ‘Blue Carpet’ will grow in almost any conditions, including exposed and coastal positions and some drought can be tolerated when planted in part or full sun. Our pot grown Juniperus Blue Carpet trees can be planted at any time of year. Remove weeds and grass within a metre of your desired planting hole, then dig a square hole as deep as your root mass and approximately 2x as wide. To help your tree establish more effectively, sprinkle Mycorrhizal root grow in the hole. Gently loosen the roots and place into the planting hole. If your soil is poor, mix 50% of the original soil with 50% high quality compost, fill in the hole and firm around gently. Make sure not to bank the soil up around the collar of the tree as this can cause problems. If you’re planting Blue Juniper in spring, summer or dry weather, water well and regularly for the first few months. Keep an eye on your young tree and increase watering if there are extended periods of hot or dry weather. If you’re planting in autumn, you may only need to water your tree a little. We also stock a range of irrigation kits, suitable for a variety of planting schemes. Once planted, keep the area free of competing weeds and grass for the first couple of growing seasons. Using a glyphosate based weed killer or installing mulch matting and bark chips will aid in this. Blue Carpet Juniper trees do not require a lot of pruning. Simply remove any dead, diseased or awkwardly placed branches from your Blue Juniper as and when you see them.